There is a trend in eBook readers today, offering to let you know what your friends are reading. As well, what they say about a book they enjoyed. 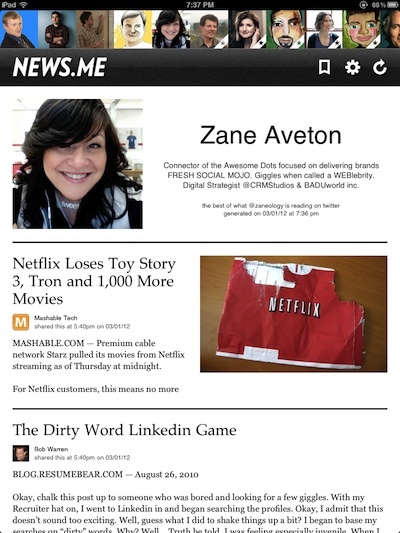 A iPad app, News.Me is offering a similar experience around the news your friends… and other people too… say is worth reading. It bases it’s decision on what to show you via Twitter posts. When you tell News.Me your Twitter account, the (Free) offers you the option to chose which people you already follow and others to keep an eye on for interesting news. 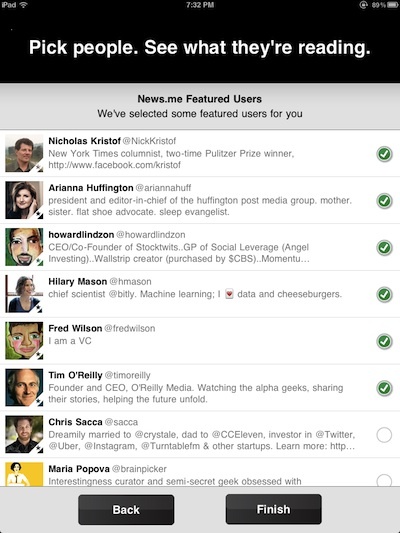 Initially, when you launch News.Me, you are provided with a list of content/news that people you follow on Twitter have been reading. 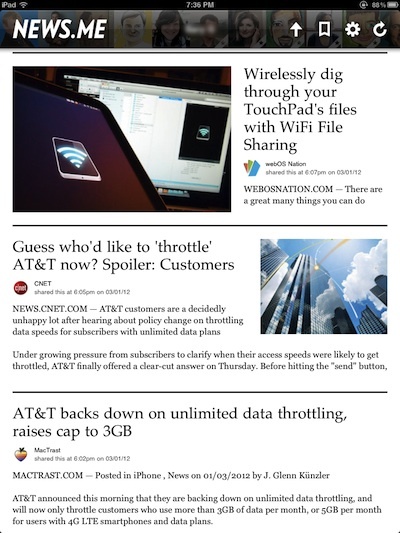 Sweep up/down to view more news headlines. You can also sweep across a post to get to the options of ‘muting’ the post (hide from all streams) or ‘Save for Later’ reading. ‘Save for Later’ is accessed through the bookmark icon in the upper corner of the screen. That same area offers a arrow to jump to the top of the news list, settings and refresh the feed. The upper bar of faces is the people you chose to keep an eye on what they found interesting to read. You can sweep the images side to side to cycle through, then tap one to choose. The lower area of the News.Me page changes from your twitter steam of liked news to one particular person’s recommendations. When choosing to view an article, News.Me allows it to appear as the text does on the Web site it is pulled from or cleaned up to just the text uniformly laid out. 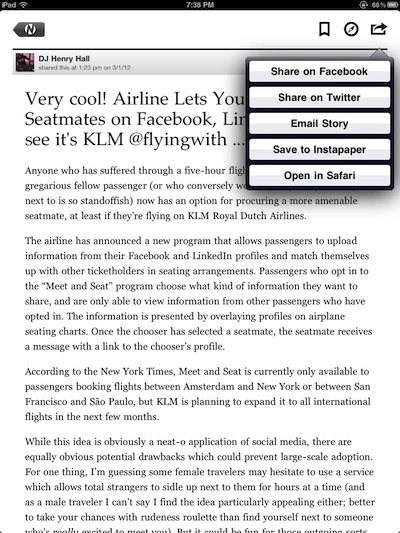 If the content is interesting enough to share, the page also offers a variety of social share and viewing via a pull down. A great way of telling other people that don’t have News.Me on their iPads that you found a article worth reading… if they had the app, you wouldn’t have to!